The Perfect Pairs guessing game is back. 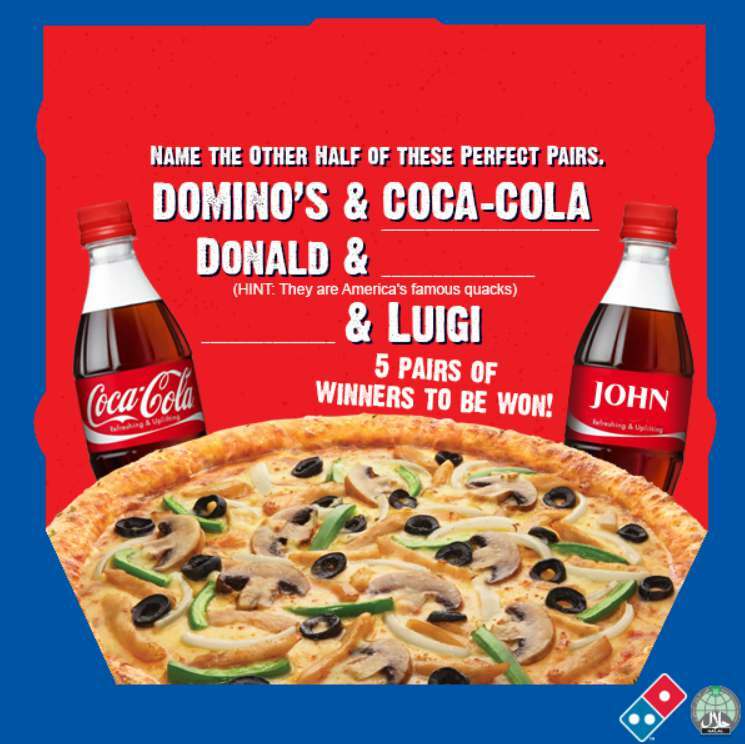 What doesn’t need guessing is how Domino’s Pizza and Coca-Cola pair so perfectly. Enjoy a bottle of Coke (1.5L) for only $2 with our 2 Pizza Deal. Can you guess who are the Perfect Pairs this time? 5 lucky winners and their partners will win a personalised Coke bottle for themselves. Find out more at Domino’s Pizza #Singapore. i) Five contests with different rules will be held during five weekends. ii) The opening dates of each contest is: 21st April, 28th April, 5th May and 19th May. For the avoidance of doubt, all dates mentioned in this FAQ refer to dates in 2017.
iii) 5 pairs of winners will win one (1) personalized Coca-Cola bottle for the contests on the 21st and 28th of April and 5th May. iv) 10 winners will win a personalized Coca-Cola bottle for the contests on the 12th and 19th of May. 1. How do I join Domino’s Perfect Pair Contest? Simply comment on the contest post. 2. How many times can I post? Accounts with more than three submissions will be restricted. Do note that multiple submissions do not improve your chances of winning. 3. When does it end? Each contest ends at 11.59PM (GMT +0800, local Singapore time) every Sunday: 23rd April, 30th April, 7th May, 14th May and 21st May. 4. How are winners determined? Winners are drawn by random based on correct answers/relevant submissions. 5. When will I know if I have won? Winners will be contacted via personal messaging on Facebook every Tuesday: 25th April, 2nd May, 9th May, 16th May, 23rd May. 6. When can I redeem my personalized Coke bottle? You will be provided with the collection address for your Coke bottle. Your prize will be ready after a minimum of 14 days, depending to the complexity of the personalization. 7. What are the guidelines for personalisation? There is an 18-character limitation, including whitespace. Your preferred label cannot consist of trademarked company names, fictional characters or obscenities. The organizer reserves all rights to withhold, withdraw or disqualify any participants at their sole discretion.